We really need to update the header photo of this blog. We have twice as many people now working with us as we did when this photo was taken in Jan. 2008. 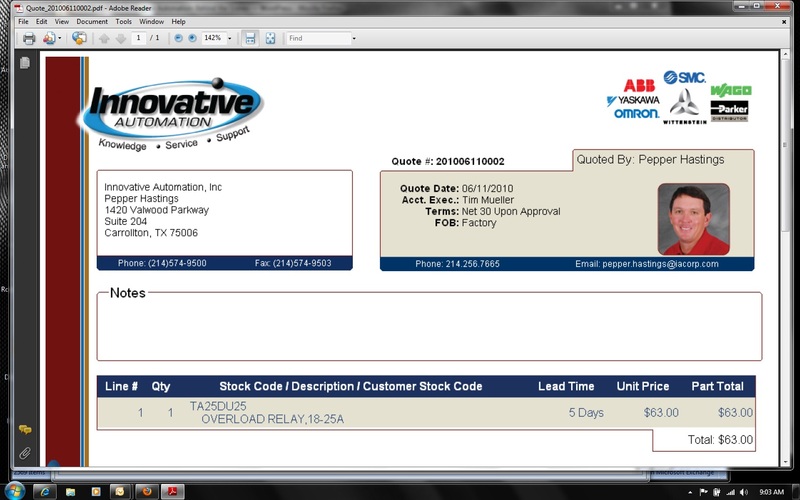 When you call Innovative Automation for a quote, you will normally receive an automated quote (like the one shown here) you can read on your computer or phone. It’s automatic, it’s innovative and it’s all a part of what it’s like to deal with the home of LEGENDARY customer service. Email us for a quote today at info@iacorp.com and try us yourself. You will be amazed. Winners for LAST MONTH are . . .
Week 1: Lonnie Wins! Most Legendary Customer Service Act of the Week! “Ask Lonnie” is a common phrase in the hallways of IA HQ. So when the customer called in with an incomplete part number, our customer service agent took the problem to Lonnie Muse. After about an hour of research, Lonnie deciphered the problem, had the correct part number pegged and the customer had the part on order without any extra effort. Truly LEGENDARY service. Week 2: Britt Wins! Most Legendary Customer Service Act of the Week! In 2009, several members of the Innovative staff joined the exclusive President’s Club which meant (this year) a seven-day cruise in the Caribbean with president Gene Gray and everyone’s spouse. Well, these kind of trips don’t just happen by magic, and it was Britt Welch’s planning of all the arrangements that made the travel part of the trip uneventful. In other words, everything was perfectly planned, and Britt made it happen. Innovative’s Mike Davila was onsite with a customer (as usual) and the topic of conversation turned to customer service. In most instances in the continental US, these conversations are about problems. However, in the World According to Innovative, they often go like this one — the customer singing the praises of how well they are taken care of by our staff. In this particular instance, it was Brad Swift who was singled out as the Keeper of LEGENDARY customer service. Nice job, Brad. Week 4: Value Added Services Staff Wins! Most Legendary Customer Service Act of the Week! With their backs to the wall on deadline, Michael Moore, Cyrus Jahani, Carlos Cardenes, Nasario Cano rocked out some control panels for a customer. Turns out in the end, they delivered a day early. Took a lot of late hours to make it happen, and the VAS was LEGENDARY to the task. 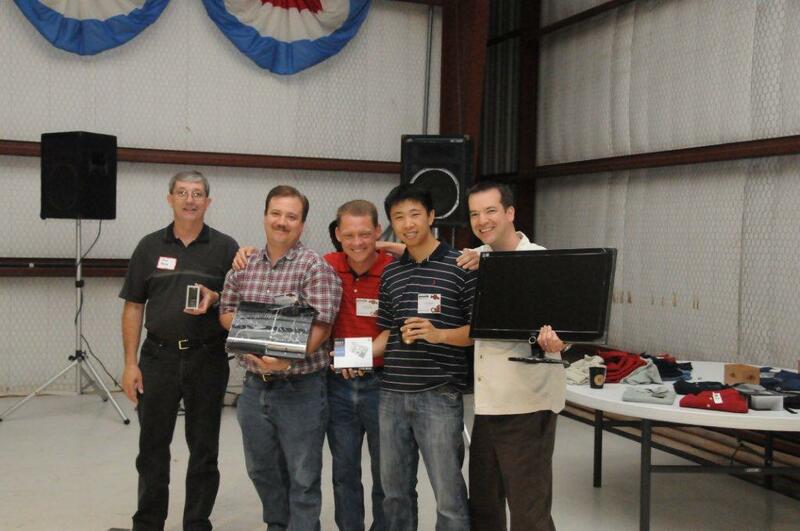 Customer Appreciation Event: Meet the Winners! These lucky customers walked away from our 10th Anniversary Customer Appreciation event with grand prizes: a giant memory MP3 player, a Playstation3, a digital camera and a 23-inch monitor. Plus, we gave away other great prizes every 10 minutes for four straight hours. LEGENDARY customer service indeed. If you weren’t in Addison for free fajitas, free drinks, free casino night, free DJ and dance floor, where were you?